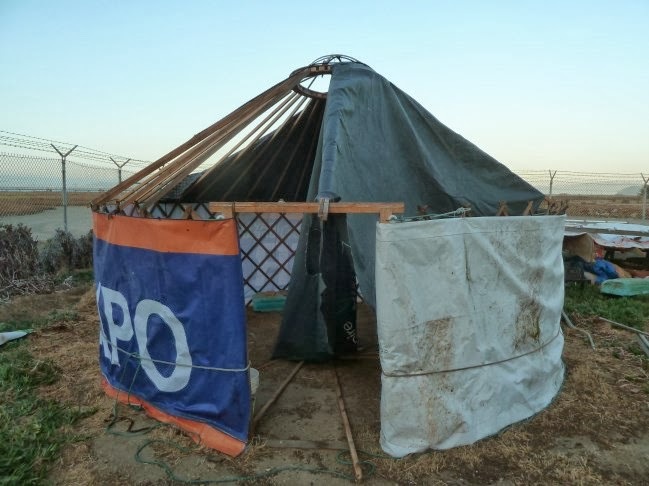 Two nights ago, the yurt underwent a spontaneous wind test. A front with wind gusts up to 50mph moved through the area. The bushes and trees were rattling against the fences and roofs and making a spectacular amount of noise. And then I realized that I had recently skinned up the yurt. It had survived the previous winter without problems but that was as a bare frame. With the skin on, the wind would be able to exert more pressure on it. I was tempted to drive out to the shop and check the yurt right away but decided to wait till morning to assess the damage if any. Next morning I drove to the shop. 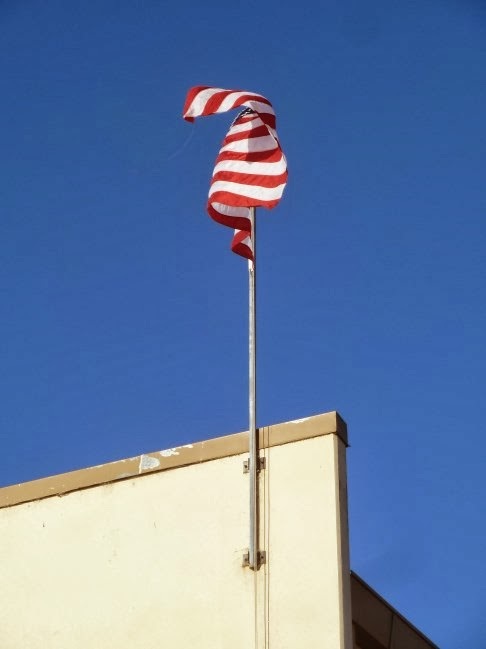 The first thing I saw was the flag down on the ground. This wasn't a good sign. I went to the back of the shop with some trepidation but there was the yurt, still standing, albeit with the roof cover partly blown off. This was no big deal since I had not sewn the final seam and the cover had a tendency to get blown off even in a light wind. A few of the roof poles had also lost their moorings and fallen to the ground. 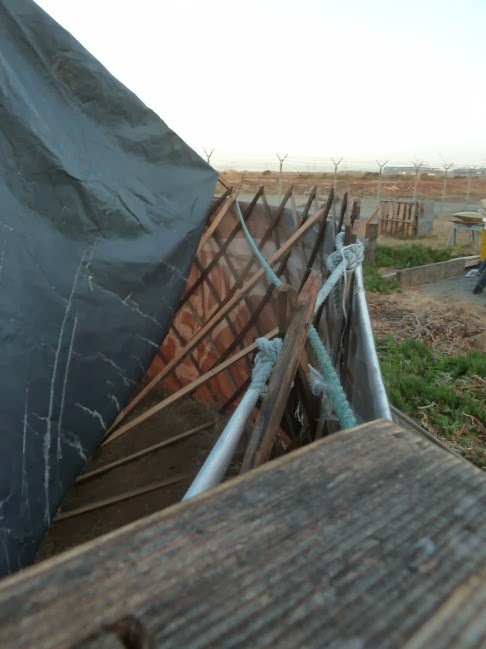 I suspect what happened that made the poles fall down was that the flexing of the wall in the wind distorted the round shape of the walls into an oval, popping off the tension band and allowing the top of the wall to bow out to where the roof poles were able to pull loose. The tension band, the green rope, is inside the wall instead of outside, apparently just rolled over the top of the wall. 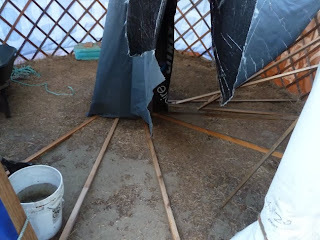 Putting the yurt back together took maybe 15 minutes. So the test was useful, revealed some more of how the yurt works. I already knew that the wall was a little too flexible. Now I knew another reason why it should be a little stiffer, to not distort in a strong wind and allow the roof poles to come loose. Also the roof covering needs better tiedowns, something I just hadn't bothered with yet. Oh, and I untangled the flag and got it back to the top of the pole. I didn't know about that. 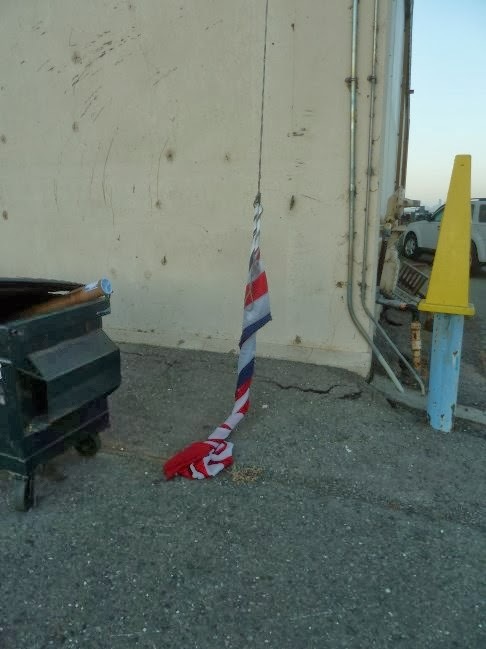 I will inform whoever owns that flag and I am sure they will take appropriate measures.